Miss Celine Fairweather's life was bobbing along like a boat on a tranquil stream when all of a sudden a summons from her beloved sister Penelope Radclyff, the Duchess of Blackthorne, changed it all. 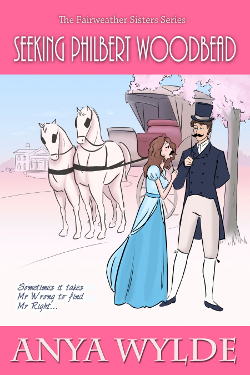 Celine hurtles off to London to help the duchess run the Blackthorne Mansion and to discover the whereabouts of her lost love Philbert Woodbead. Sensible Celine manages to keep things deathly dull and under control for a whole week until she enlists the help of the handsome Lord Elmer-a mischievous rogue, an ex-pirate, and an incorrigible flirt who is wanted dead by all of England's husbands with attractive wives. Life has suddenly turned exciting, and love has well and truly bitten her rosy buttocks. Now the only question is ... who has done the biting? This contest is now officially closed. The winner is Victoria H.
Congratulations, Victoria from The Hope Chest Reviews! In the latter part of March of the year seventeen hundred and something, a large schooner rested on calm blue waters off the coast of England. It was mid-afternoon, the water was unruffled and crystal clear, while the sky above had sent its grey clouds to London. The sun beamed down on the deck where gentlemen with missing toes, feet, teeth or hands lay draped around the schooner attempting to snooze away the day. Now, this schooner was no ordinary schooner (as you might have guessed from the hint above referring to missing limbs and such) but a piratical schooner, and the gentlemen were not really gentlemen but looters, marauders and plunderers. Yes, sir, they were murderous, unscrupulous adventurers and stinking water rats. They were all pirates. Each one of them were pirates. The whole blasted lot of them were pirates. In fact, they couldn't be more piratical if they tried. And they tried. Oh, how they tried to be more devilish than the devil himself. And one of them came close to being the devilishest ... if that is a word. If it is not, then it should be because it perfectly described the tall, muscular, grey eyed man with his long silver streaked black hair and cruel mouth. This man was so wicked that the mere reference to him caused the afternoon light to dim, the wind to blow more urgently, the men to wake mid snooze, the tea to jump out of the cup ... Where were we? Ah, yes, the captain of the ship, the head pirate, the Black bloody Rover, whose name was enough to frighten the children of the world into behaving, was the owner of this piratical schooner called The Desperate Lark and the leader of these dim muscled men. He stormed now onto the middle of the deck sending the seagulls screaming into the air. His appearance caused the men to scatter while his frown had them cowering in the bilge. While they cowered, the Black Rover grabbed the cuff of a one legged man, his most trusted aide, and in low, clipped cultured tones asked, "Who stole it, Tim?" "George Rodrick Irvin, the future Earl of Devon currently holding the courtesy title of Viscount Elmer," squeaked Tim. "The one we call Lord Wicked." "Kill him." The Black Rover was a man of few words. "And kidnap the cooks," the Black Rover continued. Tim dared to frown, "Cooks?" The Black Rover glowered. "And the chefs. I want every single person who can cook to be kidnapped and tortured until we get it back." "Torture?" Tim asked uncomfortably. "Can't we simply kill them and be done with it? I don't like torturing. It is a messy job, and I don't like it when they cry and they all cry." The Black Rover smiled harshly. He leaned closer to Tim and whispered in his half bitten ear two words, "Pigeon feathers." "Arr." Tim's sparsely lashed eyes widened in admiration. He shook his head at his captain's intelligence. The most learned man, Tim thought proudly, was right here. Pigeon feathers ... The Black Rover was a blooming genius.